A West Ham spokesperson said: "We are disgusted by the contents of the video. 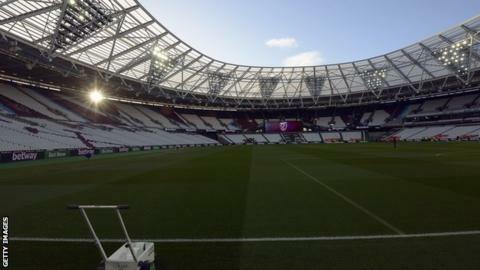 The statement continued: "We are taking immediate action to try to identify the offenders, whose details we will be handing over to the police and will be banned for life from London Stadium and from travelling with the club. Greater Manchester Police appealed for anyone with footage of the incident to contact them. Detective Chief Inspector Rebecca Boyce said she "welcomed West Ham's statement" which "quite rightly condemns these disgusting and abhorrent slurs". Last week, Chelsea supporters were captured on video singing an Islamophobic song about Liverpool's Egyptian forward Mohamed Salah, before their match against Slavia Prague. And earlier on Saturday, Fifa president Gianni Infantino urged football bodies, leagues and clubs to "apply harsh sanctions" and a "zero-tolerance approach" to racism following recent incidents in which Manchester City's Raheem Sterling, Tottenham's Danny Rose and Juventus' Moise Kean, among others, were recipients of abuse from the stands. Transport for Greater Manchester's Danny Vaughan said: "A number of incidents have been reported recently that has shone a light on a very small, but unsavoury side of football. "Whether on public transport, inside football stadiums or anywhere else, hate crime has no place in society, and we will support the police in whatever way we can in response to this incident, or any others like it."